Last visited by Rocko on February 15, 2014. Unfortunately, this tavern no longer exists. 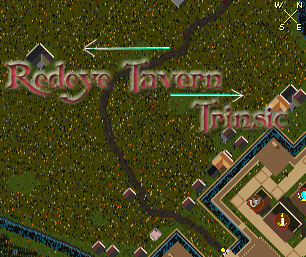 The Red Eye Tavern is located almost due West from Trinsic West Gate. Just follow the road out until it curves North, but instead of turning North, just keep running West. Under the new ownership of the Rose’s Thorn Theatre Company headed up by McIntyre it is a home for bardic events of all types. As of late they have sponsored poetry slams, comedy festivals, dark fiction nights, and a Halloween party. They also sell a wide variety of instruments while trying to promote the lifestyle of a performing bard in the world. If you haven’t ever been to the RedEye the first thing you’ll notice how different it is from other pubs. 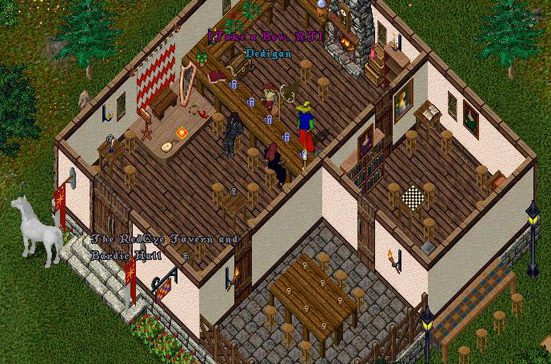 Way back in Novemeber of 1998, under the leadership of Otis, a wonderful stage was bestowed upon this tavern. I don’t think there’s anything else like this in all of Napa.